Elite: Mostly Harmless is the second Elite: Dangerous tie-in novel reviewed here on SFBook. Catch up with that first review and a bit about Elite here: Elite: Lave Revolution. 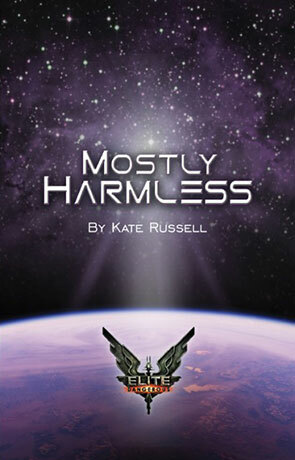 Written by Kate Russell, Elite: Mostly Harmless follows Commander Angel Rose who is forced into a life of crime. She is determined to not only survive but excel in her occupation as professional Assassin. Sounds interesting enough and if that isn't tempting you then how about the fact that 10% of the proceeds of this book will be donated to the organisation "Special Effect" who have made it their mission to beat physical disability and allow everyone to enjoy playing video games. So what's the book actually like? pretty darn good as it happens. As you might expect from the "Mostly Harmless" title, the book has humour running right at the heart of the story and it's very clever, genuine humour that hits all the right notes. And yet at times there are some very serious, occasionally graphic scenes that are all the more powerful for the juxtapostion they provide. Very clever. A gritty Elite Universe directly inspired by Douglas Adams Hitch-hikers guide works much better that I would have expected or thought possible, and this is coming from one of the biggest Douglas Adams fans you are likely to meet. Its a book that draws you in right from the start and doesn't let go with a fast pace, lots of action and one of the greatest space battles ever described. It pretty much charms the socks off you as soon as you open the first page and has a distinctly British edge. This extends to the planet "Slough" (yes the same Slough that features in the infamous poem by John Betjeman) which manages to firmly poke a stick at British industry and suburbia. It does need to be mentioned that this is a book clear geared towards the adult reader with strong language and generally adult themes (gore included). Elite: Mostly Harmless is witty and fun. It's also cool, crafty and clever. It's completely engaging and has a style all its own that manages to make the best of two disparate Universes. A roaring adventure of a novel that can hold its head high in the company of the late Douglas Adams, there is no higher praise than that. Written on 1st September 2014 by Ant.